Despite both the US and China registering softer-than-expected economic data, whereby US added 20k jobs in February (vs. consensus of 180k addition in jobs, the weakest jobs creation since Sept-17) and Chinese exports fell 20.7% YoY in Feb (vs. consensus of 4.8% decline), most of the Asia’s stock markets ended positively led by a sharp rebound of 1.92% on Shanghai Composite Index, while both Hang Seng Index and Nikkei 225 rose 0.97% and 0.47%, respectively. Meanwhile, stocks on the local front bucked the regional trend as the FBM KLCI dropped 0.91% to 1,664.63 pts. Market breadth was negative as decliners outnumbered advancers by a ratio of 7-to-3. Market traded volumes stood at 2.54bn, worth RM2.32bn. Nevertheless, selected construction related stocks such as Econpile and Jaks Resources traded higher. Although both the US (jobs data) and China (exports data) economic data came in weaker than-expected, Wall Street closed on a positive note led by tech stocks like Apple and Facebook offsetting a sharp decline in Boeing following an aircraft (737 Max 8 jet model) crash over the weekend. The Dow and S&P500 rose 0.79% and 1.47%, respectively, while Nasdaq added 2.02%. 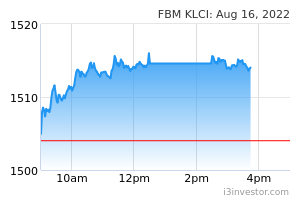 The FBM KLCI has violated both the support of 1,682 and 1,666 levels and went into further retracement phase. The MACD indicator has turned negative after the MACD Line falls into the negative region. Both the RSI and Stochastic oscillators are trending lower, but in the oversold territories. Despite the negative technical readings, the oscillators are suggesting that the key index is oversold and the key index could be due for a technical rebound with the resistance located around 1,682, while the next support will be pegged around 1,658, followed by 1,630. With the healthy rebound on Wall Street, we believe the sentiment on the local front may benefit and the FBM KLCI could be due for a mild rebound on the back of oversold technicals. However, the upside could be capped along 1,682 on the key index. Meanwhile, traders may look into construction, building materials and O&G sectors on the back of the potential revival of ECRL and firmer crude oil prices. The Dow rebounded near the SMA200 level, forming a bullish engulfing candle and snapped the 5-day declining streak and the MACD Line is hovering above zero. Meanwhile, both the RSI and Stochastic oscillators are hooking up, despite still hovering below 50. Hence, with the mixed technical readings, we opine that the rebound is likely to be short lived and upside will be capped around 26,000-26,343 and the support will be anchored around 25,000- 25,132(SMA200). In the US, we believe investors will be anticipating highly on the trade agreement, whereby President Trump and President Xi will be meeting face to face in order to iron out the trade details by next month (initially set in late March). Nevertheless, the current upside could be a short lived rebound as the recent released economic data (US jobs and China exports data) are still weak and may attract profit taking activities moving forward.